“Today was a good day. 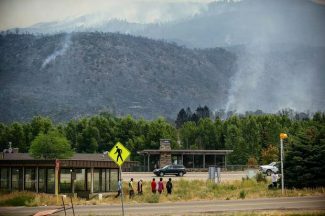 We got some resources in,” said Keith Brink, operations section chief for the Northern Rockies Incident Command team, which took control of the firefighting effort at 6 a.m. Thursday. As of 8:30 p.m. Thursday, the fire had charred 5,263 acres on private, state and federal lands between Basalt and El Jebel and the hillsides above. It was considered uncontained. The fire is expected to continue running upslope on Basalt Mountain, though Brink assured the crowd that heavy equipment had scrapped fire breaks on the northwest and northern end of the fire near Spring Park Reservoir in Missouri Heights. An edge was secured in the El Jebel area and on the eastern flank above downtown Basalt. Helicopters made multiple water drops and airplanes dropped retardant repeatedly Thursday, just as they had Wednesday. A thick, orange line of retardant ringed the hillside above downtown Basalt. While the fire was still growing Thursday, it didn’t seem as menacing based on the demeanor of people at the community meeting. Firefighters hope to gain the upper hand Friday, which is the anniversary of when 14 federal firefighters died in the South Canyon Fire on Storm King Mountain fire west of Glenwood Springs in 1994. Gov. John Hickenlooper is scheduled to visit the midvalley and command center Friday morning.